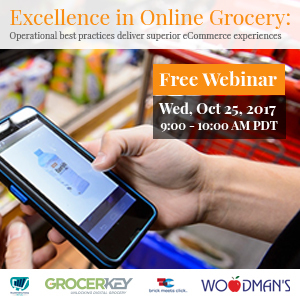 Learn how operational excellence can ensure successful and satisfying eCcommerce experiences for your shoppers. We held a Free Webinar October 25, 2017. Now you can access the archive here! Whether you are just exploring online grocery options or have years of experience, success depends on much more than just the right web site. Order fulfillment is hard to do well, and it requires adherence to several operational best practices. Click to access the webinar archive! Exclusive media sponsor: Progressive Grocer.